This has been a very exciting year! We are rebuilding the Self Care Hub. We are expanding our team. We released our first publication the “Self Care Awakening” magazine and we are finalizing our first book. Moreover, we are moving into a new Wellness Home townhouse. Moving into a new home is the impetus for this blog post. Every home should be a Wellness Home. We came up with this idea during our move, recognizing and appreciating how much we rely on our Nikken Active Wellness products and technologies for our every day self care program. Nothing is more important in our home than these technologies to create a safe, healthy environment for ourselves and our family. So what exactly is a “Wellness Home”? Basically, a Wellness Home is the healthiest and safest place for you and your family. It utilizes Nikken Active Wellness products and technologies that addresses the specific areas of concern in the Self Care Awakening. A Wellness Home provide solutions for- deep, rejuvenating Sleep, proper Hydration, reducing Environmental Toxicity (Body Burden) and achieving and maintaining a healthy Weight. Before we even slept in our new Wellness Home we brought in a few of the essentials. Water: First thing we setup was our countertop Nikken PiMag Waterfall. Filtered water is essential anywhere but especially in a home where the water hasn’t been circulating for a while. You also want to increase your daily water intake when participating in strenuous physical activity such as moving. The Keurig came in with the Waterfall because a girl must have her tea and it works in tandem with our Waterfall. Always filter the water you use for beverages or cooking. We installed our Nikken PiMag shower system next. It is very important to filter your shower water. Sleep: Our Nikken Sleep System went in next. The right amount and quality of sleep are especially important for your body when battling the mental and physical stresses of something like a move. Air: When you move into to a place that has been closed for several months, especially, after new carpet installation, the quality of air you are breathing can be very toxic. We plugged in our KenkoAir Purifiers to remove any off gassing of toxic chemicals and provide fresh, forest like air. We are moved in and our future blogs will help you build your Wellness Home. There’s no place like Wellness Home. • The KenkoAir Purifier operates without producing ozone. Ozone is classified by the United States Environmental Protection Agency as a toxic gas, yet other air filtration systems produce it as a byproduct. The State of California has banned the sale of ozone-producing air systems, and other states are expected to follow. 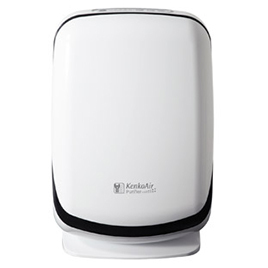 • The Nikken KenkoAir Purifier incorporates multiple-stage filtration including an ultra low penetration air filter. The KenkoAir Purifier exceeds that, with measured efficiency up to 99.9995%. No other home air filtration system matches this level of performance. • This advanced design uses minimal energy. The KenkoAir is Energy Star qualified by the United States Environmental Protection Agency. The Energy Star is given only to an appliance that is at least 35% more efficient than a standard model, and saves its owner a minimum of 215 kilowatt-hours per year. • The KenkoAir Purifier costs no more than typical home air systems that do not include ULPA filtration technology and Energy Star qualification. Only Nikken offers all these advantages at a competitive price.